ديڤد م. فريدمان David M. Friedman (ولد ح. 1959) هو محامي إفلاس أمريكي. وفي ديسمبر 2016، اختاره الرئيس المنتخب دونالد ترمپ لمنصب سفير الولايات المتحدة إلى إسرائيل. David Friedman was born circa 1959 in the Long Island town of Woodmere, New York. He attended Columbia University and New York University School of Law. Friedman is a bankruptcy lawyer who worked for the Trump Organization. He is a founding partner of the law firm Kasowitz, Benson, Torres & Friedman. In 2005, he developed a personal friendship with Donald Trump when Trump visited for his father's shiva. Friedman served as the president of the American Friends of Bet El Institutions. He has made charitable contributions to the United Hatzalah of Israel and Aleh Negev. He has authored columns in Arutz Sheva and The Jerusalem Post. In December 2016, he was nominated as the United States Ambassador to Israel by President-elect Donald Trump. Friedman is noted for his conservative political views, his belief that the "Jewish left" is a danger to the State of Israel, and that Jews who supported the liberal group J Street, are "just smug advocates of Israel’s destruction", and worse than Jews who helped the Nazis during the Holocaust. "Are J Street supporters really as bad as kapos? The answer, actually, is no. They are far worse than kapos – Jews who turned in their fellow Jews in the Nazi death camps." Friedman is an Orthodox Jew. His bar mitzvah was held at the Western Wall in Jerusalem. As of 2016, he had been married for 35 years to Tammy Sand of Miami Beach, Florida. He owns a house in the Jerusalem neighborhood of Talbiya. ^ أ ب ت ث ج Maltz, Judy (December 16, 2016). 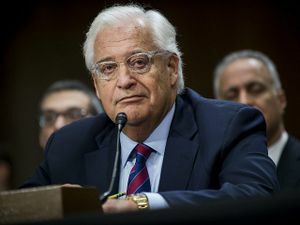 "What Do We Know About David Friedman, Trump’s Pick for Ambassador to Israel?". Haaretz. Retrieved December 16, 2016. ^ أ ب ت ث ج ح "Trump Taps David Friedman as U.S. Ambassador to Israel". Haaretz. December 16, 2016. Retrieved December 16, 2016. ^ أ ب Cortellessa, Eric (December 16, 2016). "Trump taps adviser Friedman to be US ambassador to Israel". The Times of Israel. Retrieved December 16, 2016. ^ أ ب Kampeas, Ron (December 15, 2016). "Trump nominates David Friedman as ambassador to Israel, where he will ‘work from Jerusalem’". Jewish Telegraphic Agency. Retrieved December 16, 2016. ^ أ ب ت "President-Elect Donald J. Trump Nominates David Friedman as U.S. Ambassador to Israel". greatagain.gov. Retrieved December 16, 2016. ^ أ ب Friedman, David (5 June 2016). "Read Peter Beinart and you'll vote Donald Trump". Arutz Sheva israel national news. Retrieved 16 December 2016. ^ Sharman, Jon (16 December 2016). "Donald Trump's Israel ambassador said Jews who back two-state solution are worse than Nazi collaborators". The Independent. Retrieved 16 December 2016. ^ ROSENBERG, MATTHEW (15 December 2016). "Trump Chooses Hard-Liner as Ambassador to Israel". New York Times. Retrieved 16 December 2016.